Heat oven to 350°F. Cook and drain pasta shells as directed on box. Meanwhile, in 12-inch nonstick skillet, cook beef over medium-high heat 5 minutes, stirring frequently, until thoroughly cooked; drain. 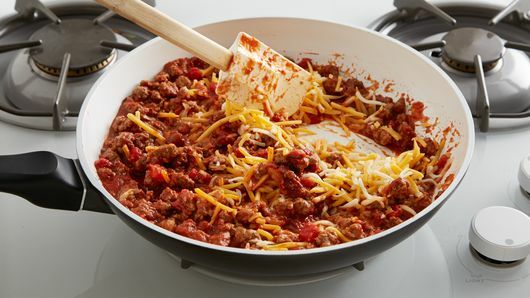 Add taco seasoning mix, crushed tomatoes and 1 cup of the shredded cheese; stir well until cheese is melted. Fill each pasta shell with about 1 tablespoon beef mixture; place in ungreased 13x9-inch (3-quart) glass baking dish. Top filled shells with plum tomatoes and chopped cilantro; sprinkle with remaining 1 cup cheese. Bake 15 to 20 minutes or until heated through and cheese is melted. Serve warm. If you prefer more heat, try some chopped jalapeños on your shells. Ground turkey is a great substitute for ground beef in this dish. 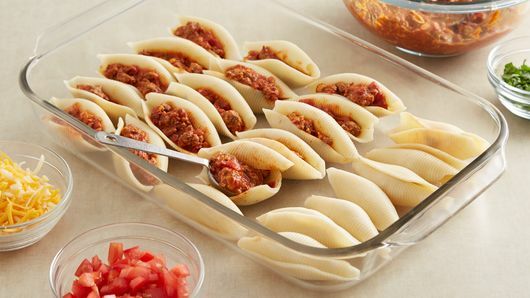 Stuffed shells in a baking dish is an Italian-American classic—it’s often filled with a ricotta cheese mixture and smothered in a red sauce with more cheese much like manicotti, but it’s much easier to fill. Manicotti is a type of large tube-shaped pasta that often requires the mixture to be piped in, which can be difficult and time consuming. Stuffed shells, on the other hand (called “conchiglioni” in Italian, which translates to “seashell”) are easy to stuff. All you need is a spoon and your hands! This taco stuffed shells recipe breaks from tradition in ditching the ricotta filling for a Mexican-inspired one. 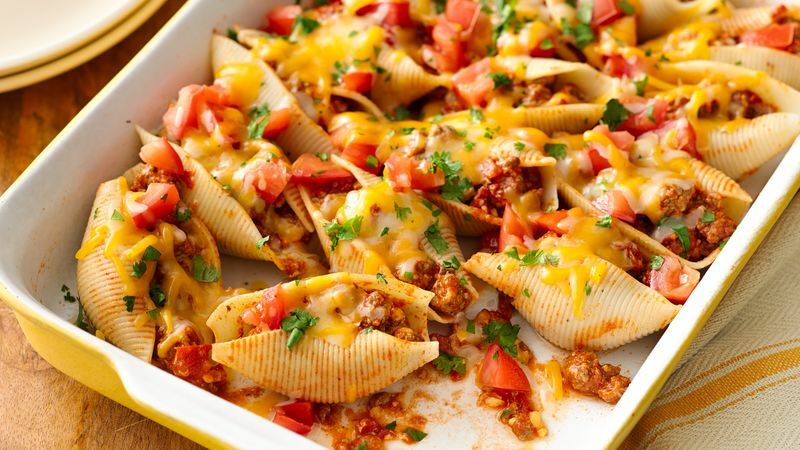 Shredded Mexican cheese, ground beef, taco seasoning and crushed tomatoes combine to make the best stuffed shells filling you never thought of, and one you’ll want to make again and again. The taco fun doesn’t stop at stuffed shells. Check out all of our delicious twists on Mexican food by browsing our collection of top-rated recipes.